We had yet another appointment at the doctor’s office this week to get on their routine schedule. The appointment came equipped with a bossy, argumentative nurse practitioner, who decided my timeline from the M.D. wasn’t accurate. Whatever! Needless to say, not smart to argue with a hormonal pregnant woman. The joy of the week was starting to share our secret! We decided to wait until I was almost through my first trimester in the event of a miscarriage. 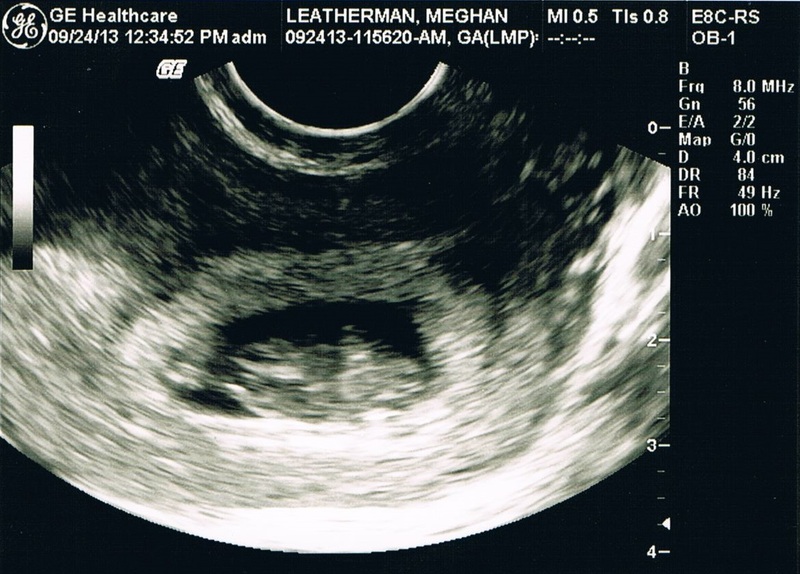 Since we’ve seen a healthy, rapid heartbeat, we’re feeling pretty good about sharing the news. We sent care packages to our parents, the hubs grandparents and my sister. Each received a brag book with sonograms from six and eight weeks. We also sent little boxes with Hershey’s hugs & kisses. Our parents also received journals for them to write about their life to give to the baby in nine months (we’ll see who wins that!). They all thought we were sending wedding pictures – fooled them! We also traveled to San Diego for a long weekend and were able to share our news with some friends and extended family. It’s so much more fun creating this life with joy from the people you love. While there, both my aunts made delicious, healthy meals for us. I was in heaven eating food I didn’t have to prepare or that didn’t come from a fast food spot (while this ends up being all I can eat, it totally turns me off mentally!). The hubs was beyond ecstatic to have real, good food and lots of it! Friday night we enjoyed salmon, rice, salad and ice cream (of course!). Saturday was some delicious Mexican chicken creation. Sunday was a surf and turf spread with shrimp fresh from Galveston, Texas, gorgeous filets, caesar salad with my aunt’s secret recipe and two loafs of bread – sourdough or olive loaf. YUM! For dessert, we had apple cherry cobbler fresh from Julian with … you guessed it … ice cream! Good thing I’m getting my calcium covered! Metcon: Four rounds for time – 200m run, 20 wall balls, 20 squats 20 over head weighted lunges (45/25) – 16:57 for 3 rounds; was feeling spent from the running and wall balls. Heart rate hovered around 164 rpm. Food: This week is about the same as last. Craving lots of carbs and ice cream. Aversion to cooking/handling meat. Sadly, my box in San Diego was closed for the weekend while the coaches were at a training camp. Wish I could have squeezed in another WOD or two. Posted on October 8, 2013 by crossfitpregs. This entry was posted in CrossFit and tagged cooking, CrossFit, CrossFit Mom, CrossFitting, Fit Pregnancy, pregnancy, pregnant woman, WOD. Bookmark the permalink.